Driving in snow is a part of life in Southern New England. The best approach is to prepare your car for winter travel and plan ahead in your personal schedule for extra travel time during storms. It's best to avoid any unnecessary travel, especially when snowfall rates are predicted to be the heaviest. Each fall you should inspect your car or truck or have a mechanic review it to ensure you are ready for winter driving conditions. Even during the course of the winter it's important to keep an eye on key systems that could hinder your vehicle's traction, ability to brake and ability to run well in the cold. High on your checklist should be tires, anti-freeze, battery, brakes, heater, exhaust system and lights. And always top off your gas tank before the storm hits. Making safety the highest priority should be the most important thing when driving - even more so during inclement weather. Reduced traction, increased stopping distance and poor viability require our full attention behind the wheel. Don't forget to buckle up before you begin your trip, and put your phone away to avoid distraction from calls or texts. 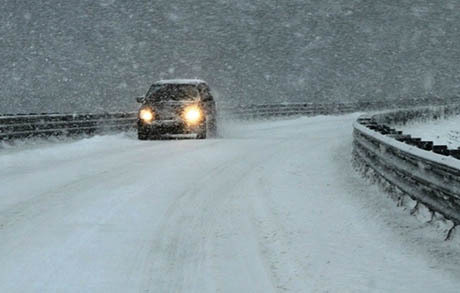 Driving with reduced speed is one of the most important things you can do when snow's on the ground. Don't be lulled into a false sense of security with the technology in today's cars. Four-wheel drive, anti-lock brakes and traction control certainly help, but only to a point. They can't take the place of good driving habits and the need to reduce speed when roads are slippery. At the start of the storm - Not all roads my be treated yet. During very heavy snowfall - Snowfall rates exceeding an inch an hour will lead to accumulation on the road in between passes of the plow. During peak travel periods - Storms hitting morning and evening rush hours are a recipe for congestion and delay. Even secondary roads can experience unusually long backups as people seek alternate routes to car-clogged highways. During changing weather conditions - Changes from rain to snow or vice versa can create special hazards including black ice, localized flooding or downed limbs or power lines from heavy snow or accumulated ice. After a storm, when temperatures drop below freezing - Black ice often develops in the evening following a storm due to snow melt washing off residual salt on pavement and re-freezing. RIDOT takes every effort to alert motorists to changing conditions. Before you leave, review the travel planning resources on this website or check our Facebook or Twitter pages, which may have more current announcements. When on the road, look to our electronic message boards or Highway Advisory Radio system (1630 AM) for vital travel information. After the storm, clear all snow and ice from your windows, hood, roof and trunk of your vehicle. This is especially important for drivers of box trucks, tractor-trailers and other large vehicles. A sudden release of snow or ice on the highway can create hazardous driving conditions, cause a crash or damage a vehicle behind you. Clearing ice and snow from your vehicle is not only a good idea, it's a law. Snow removal equipment is big and heavy and our drivers are very focused on effectively clearing the roads. Remember to not "crowd the plow" and give these trucks plenty of room. The best place to be during a storm is behind a plow truck. Drivers should stay at least five car lengths behind to give them ample room to operate. Do not pass, especially on the right where large amounts of snow are kicked up by plows. Walking from your car in a storm is very dangerous. You can lose your way, wander out of reach and/or become exhausted. Your vehicle is your best shelter. It's better to be chilly and awake than to be comfortably warm and be overcome with carbon monoxide fumes. Keep your exhaust pipe free of snow and run your engine only for short periods of time, leaving a window away from the wind slightly open. Loosen tight clothing and change positions frequently. Move your arms and legs, massage fingers and toes; tuck your hands between your legs or under your armpits. Huddle together with others to share body heat. Elevate your feet to improve circulation. Whether you are calling emergency services or a roadside assistance company, be prepared to describe your location, the condition of those in the car and what happened. Plow Snow? Join us in Keeping Rhode Island's Roads Clear this Winter!